As I mentioned in my posts about bourru and bernache, tradition has it that you eat roasted chestnuts with these young “wines” that show their faces only in the autumn. There are two words for chestnut in French: marron and châtaigne. While we don’t seem to distinguish between the two in English, we certainly do in French. 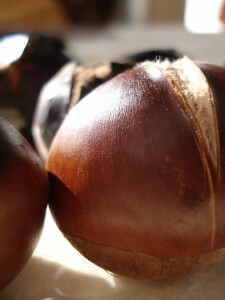 Marrons come from marroniers (cultivated chestnut trees) and châtaignes come from châtaigniers (wild chestnut trees). They are very similar; in fact, a marron is technically a type of châtaigne. Both nuts fall from the tree when ripe and are encased in a prickly bur. One difference between the two types of nuts is that the marron bur will contain only one “fruit”, while that of the châtaigne will contain two or three. Marrons are larger and rounder than châtaignes. In France, you’ll find marrons used in a variety of specialties, such as marrons glâcés (sweet glazed chestnuts) or crème de marron (a grainy spread often used in dessert crêpes). Châtaignes are the best for roasting. In France, they’re often collected off the ground by passersby, taken home and eaten on chilling fall evenings. You will also see them for sale at farmers’ markets and in certain grocery stores- already taken out of their outer burs, but still enclosed in their dark brown shells. Now’s the time to take advantage of these cheery little nuts, as they’re only around from September to February. This last week, I tried home-roasted châtaignes for the first time- and what a treat! When cooked just right, the inside fruit is warm and steamy, soft and pasty- not at all like the other nuts I know. I didn’t just eat, though; I also learned how to prepare them. Here’s the very simple and traditional recipe that Sébastien’s family shared with me. All you need are chestnuts, an old cast iron pot and some heat. We used a gas flame, but I’m thinking you’d might be able to roast them on an electric stovetop or even in the oven. 1. Cut two small slits into the shell of each chestnut with a paring knife. This keeps the nuts from exploding during cooking. 2. Begin heating pot over a high flame and add prepared chestnuts- as many an each person wants to eat! 3. Cook for about ten minutes or more (it’s better to overcook than undercook). Test one chestnut by cutting it open with a knife- the outside will be blackened and the entire inside should be soft and warm. 4. Transfer chestnuts to a bowl and enjoy with some bourru, bernache or your favorite white wine. A few hints: You eat each chestnut as you open it. Just off the flame, they will surely burn your fingers, so use a cloth napkin to hold them. Also, use a small knife (or your daring fingers) to help open the shell and dish out the “fruit.” Before biting in, make sure the nut isn’t dark-colored, a sign of mold or rotting. That happens in nature! We enjoyed our châtaignes plain- not salt, no butter, nothing- pure, simple tradition. This entry was posted in Recipes (All), Recipes (Gluten-free), Recipes (Vegan) and tagged nuts. Bookmark the permalink.